in which K and X are the parameters. In the conventional Muskingum method these parameters are determined by calibration using measured inflow and outflow hydrographs. On the other hand, in the Muskingum-Cunge version K and X are calculated using the formulas derived by Cunge (2). The experience with the Muskingum-Cunge version is reported herein. It is shown that the way of calculating the parameters has a definite bearing on the overall accuracy of the method. As shown by Dooge (3), the assumption of constant parameters makes the solution dependent on the reference values chosen to evaluate these parameters. A more physically realistic approach is to consider the parameters K and X to vary in time and space according to the flow variability (6). Koussis (5) has considered a discharge-dependent K but has assumed X constant on the grounds that the computation is relatively insensitive to this parameter. In general, however, it is desirable to allow both K and X to vary with the flow. Fig. 1 Space-time discretization of Muskingum method. 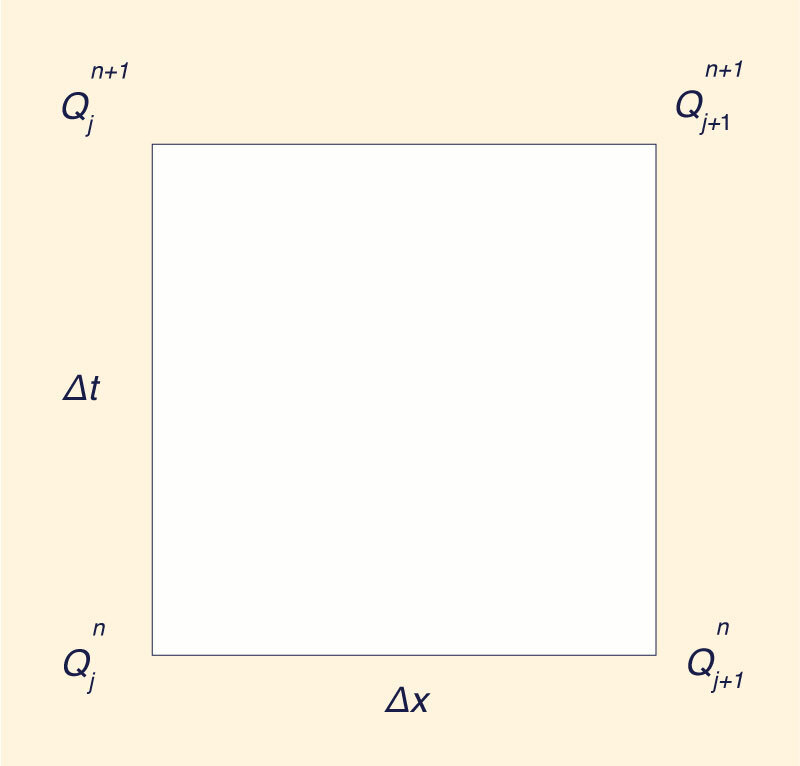 in which C = c Δt /Δx is the Courant number; and D = (q /So)/cΔx is a type of cell Reynolds number. Both C and D have physical and numerical significance, C being a ratio of celerities and D a ratio of diffusivities. By iteration, using a four-point average calculation. To improve convergence, the values at (j + 1, n + 1) obtained by the three-point average method are used as the first guess of the iteration. in which t is in hours. Thomas applied an approximate method to route the flood wave through a channel 200 miles (322 km) long, using a time interval of Δt = 12 hr. Thomas' approximate method neglects the inertia terms; therefore, his results are directly comparable to those of the Muskingum method (both the Thomas and Muskingum methods can be considered as numerical analogs of the diffusion wave equation). Figure 2 and Table 1 summarize the results of computations using the Muskingum-Cunge method with variable parameters. For comparison purposes, the calculations using constant parameters for three reference values of discharge are also shown. Fig. 2 Calculated hydrographs as described in Table 1.
a MC/200= constant parameter Muskingum-Cunge Method, reference discharge 200 cfs (5.66 m3/s); MC/125 = constant parameter Muskingum-Cunge Method, reference discharge 125 cfs (3.54 m3/s); MC/50 = constant parameter Muskingua-Cunge Method, reference discharge 50 cfs (1.41 m3/s), VPMC2 = two-point variable parameter Muskingum-Cunge; and VPMC3 = three-point variable parameter Muskingum-Cunge, VPMC4 = four-point variable parameter Muskingum-Cunge. The Muskingum-Cunge method with constant parameters (hydrographs B, C, and D) shows results that are dependent on the value of reference discharge chosen to evaluate the constant parameters. The higher the reference discharge, the faster the rate of travel and the lesser the subsidence of the flood wave (3). The calculated outflow hydrographs show negligible distortion from the initially sinusoidal shape, implying that the constant parameter assumption is tantamount to an assumption of linearity. The Muskingum-Cunge method with variable parameters (hydrographs E, F, and G) shows results that fall within the range encompassed by the constant parameter calculations. The noticeable steepening of the rising limb of the calculated outflow hydrographs indicates that the nonlinearity of the phenomenon is being taken into account. The three-point and four-point methods give similar results; however, the two-point method shows a smaller peak and a somewhat slower rate of travel. Furthermore, the two-point method results in a significant loss of mass, as indicated in Col. 8 of Table 1. The results of the Thomas and four-point variable parameter methods are comparable (hydrographs I and H). The three-point variable parameter hydrograph (not shown) is also very close to Thomas' results. The Muskingum-Cunge method in which the parameters K and X are allowed to vary in time and space is investigated. A three-point approach and an iterative four-point approach to the calculation of the variable parameters are shown to be sufficiently accurate in the simulation of flood flows. A two-point approach is shown to be inaccurate in the calculation of peak discharge and travel time. Furthermore, the two-point method results in a significant loss of mass. Chow, V. T., Handbook of Applied Hydrology, McGraw-Hill Book Co., Inc., New York. N.Y., 1974. Cunge, J. A., "On the Subject of a Flood Propagation Computation Method (Muskingum Method), Journal of Hydraulic Research, Vol. 7, No. 2, 1969, pp 205-230. Dooge, J. C I., "Linear Theory of Hydrologic Systems," Agricultural Research Service Technical Bulletin No. 1468, Oct., 1973. "Flood Studies Report," Vol. III: Flood Routing Studies, Natural Environment Research Council, Landon, England, 1975. 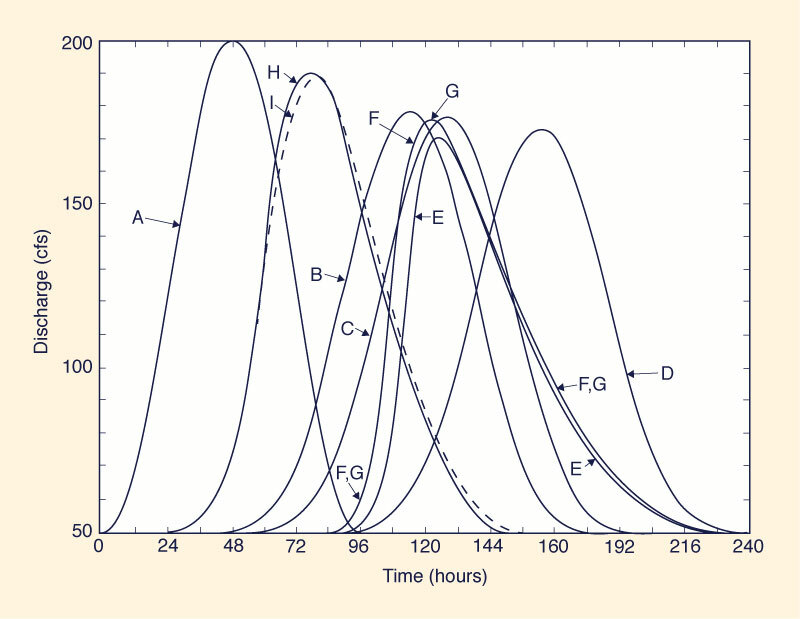 Koussis, A., "Theoretical Estimation of Food Routing Parameters," Journal of the Hydraulics Division, ASCE, Vol. 104, No. HY1, Proc. Paper 13456. Jan., 1978, pp. 109-115. Miller, W. A.. and Cunge, J. A., "Simplified Equations of Unsteady Flow," Unsteady Flow in Open Chonnels, K. Mahmood and V. Yevjevich, eds., Water Resources Pubhcations, Fort Collins, Colo., 1975. Roache, P., Computational Fluid Dynamics, Hermosa Publishers, Albuquerque, N.M., 1972. Thomas H. A.. "The Hydraulics of Flood Movement in Rivers." Engineering Bulletin, Carnegie Institute of Technology, Pittsburgh, Pa, 1934.